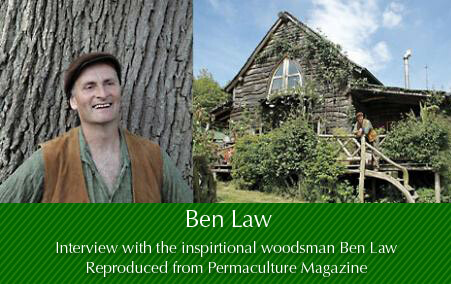 This interview has been reproduced from the Permaculture Magazine website. Martin has subscribed to Permaculture Magazine since its early issues. It continues to inspire him and first introduced the life and work of Ben Law to him over a decade ago. An interview with Ben Law, the British woodsman who built the Woodland House and became Grand Design's favourite build and originator of roundwood timber framing. Willi Paul asks him about permaculture, his beliefs, how he see the future and his search for work/life balance. "I could network with so many people, but would I find time to grow food and harvest firewood. As you have experienced with our brief exchanges, I prioritize the land over my lap top. After all you can't eat a lap top." "Don't matter how much money you got, there's only two kinds of people: there's saved people and there's lost people." How has your idea of stewardship changed over the years? Are you an ecologist? I guess I am kind of an ecologist, but I prefer not to label myself. I got involved in managing woodlands as I wanted to protect them and realized that sustainable forest management was a good way to try to achieve that. As I have settled in one place and got to know the woodland year by year my depth of understanding has grown. The connections of life cycles of plants to insect /butterfly/ woodland management become clearer and working in ways that produce timber but benefit flora and fauna has become a key focus – hence my love of coppicing. Coppicing is a form of woodland management when the human activity (cutting of broadleaf trees during the dormant winter period) is an essential part of the diverse flora and fauna within the forest. Remove the human input and biodiversity greatly decreases. How many other land use systems can you say that about? And of course you have the bonus of the produce from which to build structures and keep warm. LIFE, being alive every day on this incredibly beautiful planet. I don't take it for granted; I am not relying on coming back. Sitting on my veranda watching a thunderstorm erupt on a humid summers evening and smelling the woodland soil as the rain hammers the parched ground and the sweet scent of jasmine cutting through, add a glass of wine and a beautiful woman – its getting sacred now. Name three of your heroes? What is common to all of them? Bob Dylan, Mahatma Gandhi, and Prince Charles They all have a voice and have shown protest through songs, actions or words. Prince Charles is probably the odd one in the mix. I am not an advocate royalist, but Prince Charles has stood up and spoken out about his environmental beliefs. His 60th birthday speech was an amazing example of where he passionately put the case for 'Nature' and how he felt he must stand up for nature and give nature a voice. For someone saddled with the expectations and rigid lifestyle of royalty he has let his truth come through. Green building often sounds like a radical alternative to the chemical-laden, modular & labor-saving ways of modern house building. What are the key principles in your practice? I got into green building as I had a renewable source of timber poles and wanted to make good use of them. I believe the building industry to be one of the most wasteful of industries, and I want to show it doesn't have to be that way. I also wanted to shift the perception in architects who design buildings often with good imagination and then source the materials to build their designs with from all corners of the planet. I want to take architects into the forest and say to them "Today, there are 50 coppiced chestnut poles, 10 larch and 5 western red cedar ready to be used. Go and design you're building from this starting point". It is about putting the local resource first, choosing renewable materials and reducing transport distances. My house has been built for 10 years, the trees I cut the main timbers from are already carrying 6 meters of regrowth, by the time my house is 30 years old, another house will have grown from the same stumps I built mine from. Roundwood timber framing involves the use of timber in the round. Small diameter poles which are jointed together to make frames with joints adapted from traditional timber framing and log building. We source all our materials from only a few kilometers of the building site. We choose naturally durable timbers and create aesthetically pleasing buildings. We use breathable materials, natural insulation and recycled materials (no fresh concrete) for foundations. These are buildings that have soul. They are places where humans can settle and want to stay; they are buildings of our future. Is permaculture a revolution in the UK? Can you please define this for us? I would not describe permaculture as a revolution in the UK, more of an awakening in people realizing that in order to create a world with some hope for the next generation it is time to start with ourselves and our local communities and create the world we want to see. The design principles of permaculture create the framework to begin this process of change. When Maddy Harland from Permaculture Magazine gave me your name and background, we talked about new mythology based in permaculture. What songs, poems, symbols and/or places come to mind when you think about post WWII green mythology? There have been many mythologies and stories that flow through permaculture. My own story is used by many for inspiration. Tales of 'the Diggers', 'battle of the beanfield' 'tony wrench's roundhouse' 'greenham common camp' 'lammas community' 'transition movement' 'roundwood timber framing'....festivals,environmental art performance/poets/songs... it's all in there being passed from campfire to campfire from one traveler to another, our stories are forming, our lives are the history of hope for those yet to come. How do you understand formal religion dogma vs. things spiritual? Are you pagan in any sense? I would not describe myself as a pagan but changes in the seasons, longest and shortest days have tangible meaning when you work on the land. I don't want to focus on religious dogma, I believe its time will pass. I celebrate what is real to the way of life I am living, the end of the coppicing season, the birth of a child, the seasonal arrival of the nightjar having achieved its migratory journey back to the forest where I live and where it was born. If you could ask Bill Mollison a coupla' of questions, what would they be? + Would you like a glass of my birch sap wine? + Did you watch the Ashes? Imaginative: This alchemy excites and creates our ideas, conflicts and even prayers in our brains. Eco: Seeds, soil, plants and animals living, birthing and dying in a inter-related system pulsed by eco alchemy. Shamanic: This is alchemy transmutates healing through ceremonies and rituals lead by a trained spiritual leader. Sound or Sonic: The ancient alchemic power of song from cave rants to classical music and rock'n'roll. Digital: Electronic learning and feeling working with computers including chat text, email and documents. Community: People working with people: transforming attitudes, sharing ideas and making plans. Earth: Planetary consciousness building and human evolution on a universal scale. I would not call myself an 'EcoAlchemist'. Although I see value in all the areas (alchemies) you highlight; I prefer not to get bogged down with labeling and as much as the intentions may be good, your definition in shamanic –' rituals led by a trained spiritual leader' is always open to abuse. Whose training? Whose dogma? Whose power trip? This is not to say that there are not many evolved shamanic teachers but I would keep the spiritual for the individual to discover and perceive at a personal and localized level rather than risk creating an eco-religion. What does your local community look like in 2051 to you? Similar to today, but with a few key differences. People no longer go to work in the way they did. People get up and do what needs doing, growing food, harvesting timber, childcare. There is more of a communal spirit and sense of self organization. The roads are pretty empty, a few solar vehicles and horses. The fields of polo ponies have gone, we ate those long ago. A horse needs to pull tools to be looked after now. Population is smaller, many died in the epidemic and others in the transition. No one travels anywhere anymore except in an emergency, we are learning to enjoy what we have. I am still working on finding this balance. The amount of knowledge available through networking is mind blowing when you grew up with just a few books. The challenge for me is balance in this .I believe that technology and communications have a major role to play, and we need to embrace the positive side of this. However, I could network with so many people, but would I find time to grow food and harvest firewood. As you have experienced with our brief exchanges, I prioritize the land over my lap top. After all you can't eat a lap top. Ben Law lives and works at Prickly Nut Woods in West Sussex, UK, where apart from making a living from coppicing he trains apprentices and runs courses on sustainable woodland management, eco-building and permaculture design. Ben runs a specialist eco-building company called The Roundwood Timber Framing Company Limited. His firm specializes in the supply of roundwood construction timber and a building and project management service. He is author of The Woodland Way, a permaculture approach to sustainable woodland management and The Woodland House, which charts the building of his unique cruck framed home in the woods. The building of his house was filmed for Channel 4's Grand Designs program and was voted the most popular Grand Design ever by viewers. Ben has also written The Woodland Year, a month by month journey through the woodland, a celebration of every aspect of sustainable woodland management, including crafts, seasonal recipes and the rhythm of work throroughout the year. Ben's latest book is Roundwood Timber Framing, a full colour guide to his building techniques which he has also described in a comprehensive training DVD by the same name. Ben runs occasional open days and courses in response to popular demand. Chelsea Green distribute all of Ben Law's books in North America.